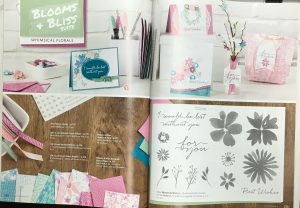 The Blooms and Bliss stamp set is one of those sets that can be so versatile for back grounds. You can easily use it to make your own Designer Papers. When I go searching for ideas for Thank you’s for my customers I go straight to one website, Pootles.co.uk. Sam Donald has so many fantastic ideas for Thank you’s. As I was searching through her videos on Youtube I came across this notepad that she did using the colours from some current designer papers. I thought that was a great idea as a thank you to my customers. 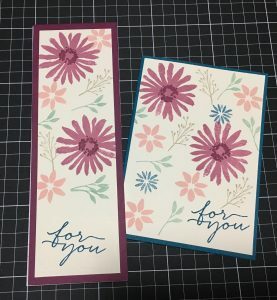 I was inspired by the Blooms & Bliss DSP so used those colours and the Blooms & Wishes stamp set to make these gorgeous cards & notepads. All my customers who purchased through me in June received this notepad & card. I didn’t write in the card as I wanted them to be able to send it onto someone themselves. I love this set and the colours are just divine together. If you’d like to order the Stamp Set then you can go to my online shop and purchase yours today! This entry was posted in 2016-2017 Annual Catalogue, Blooms & Wishes, In Color, Stampin, Stampin' Up and tagged Blooms & Bliss, Blooms & Wishes, For You, Note pad, Pootles, Thank you gifts by sharon. Bookmark the permalink.